I was currently wanting to get G.Skill Trident Z RGB ram in 2x16 Gb for my new Coffee Lake build, but it costs £450 which is way too much with these current extortionate ram prices! However, I just managed to find and ordered some more 2x16 Gb 2666 Mhz Crucial Ballistix ram for just £270! And also this time in white which was my exact second choice with how nicely my current silver ones matched my Z370 build, but also the rest of the build is going to be white (white GPU & Case), and I can take pictures with this matching ram in both silver and white (my silver ones are 2x4 Gb as per my other thread and meant to be for my Pentium G4400 back up build, which I am eventually going to build up into a NAS and security setup with smart cameras for my house). This is also around the same price I paid back in 2016 for my previous 4x8 Gb Corsair kit for my previous X99 build. 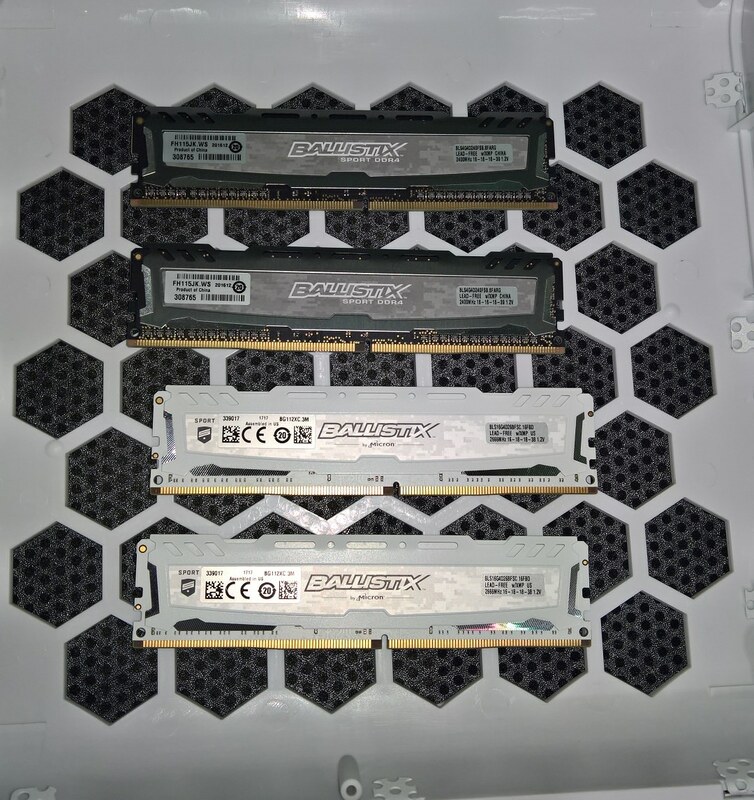 I'll be getting the new 2x16 Gb white ballistix ram next week (no dispatch over the weekend, and I've been given Tuesday for my estimated delievery date), and will take and add a load of pictures. Unfortunately though I still dont have my white mini ITX case to fully complete the build yet, I have it installed in my black case while my G4400 setup sits in a box. OMG my white Thermaltake Core V1 case also dispatched today along with an RGB fan and this ram. I also have some custom casemod cables for my PSU in black / white. Tomorrow is going to be bliss. @WTBBallistix Enjoy your upgrades! We hope you post your pictures here when you are finished. It sounds like it will be an awesome system. Please let us know if you run into any questions or concerns as you upgrade. Its all fully assembled along with my G4400 backup PC. I have the 2x4 Gb 2400 Mhz sticks back with the G4400, and the 2x16 Gb 2666 Mhz sticks with the 8700k. 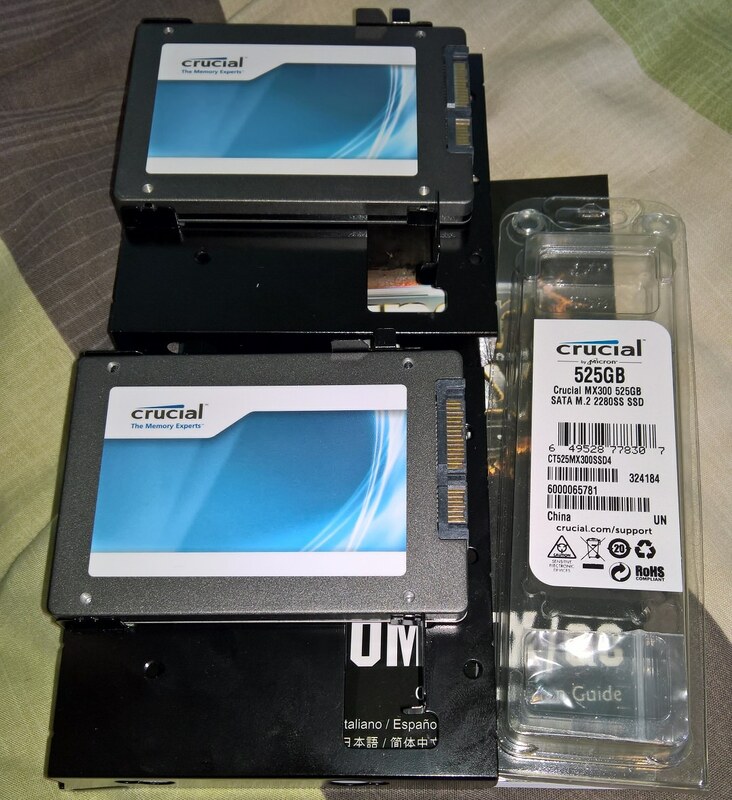 Also the 525 Gb M.2 drive is my new boot drive on the 8700k build, then I also have a 128 Gb and 512 Gb Crucial M4s that are now both being passed down to the G4400. I also have Raid 0 1 Tb Samsung Evo 840s, and Raid 1 6 Tb Seagate Barracuda Pros in the main build, but am also considering turning the G4400 build into a NAS in the future. I still really want the 2 Tb Samsung 960 Pro nvme drive ... wait I mean, I really want TWO of them in PCI-E raid 0 that my new Z370 board supports, but they cost way too much. For now I will have to keep using the Raid 0 Evo 840s. Also the white Gigabyte 1080 Ti I bought for £719 at the start of January already costs £850-899!!! I'm glad I bought it when I did, I got both the GPU and this ram at great prices compared to how silly they cost now. I couldnt even buy the current ram kit at £327 on the crucial website, I was searching endlessly to find it for under £300 which I just did. Im hoping I can get this ram to CL14 with 1.35v, and OC it a little above 2666 Mhz, my 2x4 Gb kit already managed that so this one hopefully should too. 32 Gb of 3200 Mhz CL14 ram with Samsung chips is what costs £450, and that would maybe only give an extra 5% performance at most on coffee lake which isnt worth it. As I predicted, at 1.34v, I've got this ram working stable at 14-16-16-30-1T timings at 2700 Mhz. 2800 Mhz was almost stable at 1.38v, but it still crashed within an hour of gaming, so I backed it down to 2700 and reduced the voltage a bit more instead. Memory reviews on the 8700k show minimal gains over 2666 Mhz CL14, so for a £180 saving over my first choice of G.Skill RGB ram with much higher clocks at CL14, Im hardly going to notice any performance loss, and if ever the price on those kits come down I can just sell this one and upgrade later on, but really it would just be for the RGB. I just had another glance at ram prices to see if they had come down yet, and sadly not - 32 Gb of Samsung B die is still over £400. So I felt like trying to see if I could Cas 12 stable on this kit - Its working right off the bat at 1.4v, 12-16-16-28 timings, and at 2700 Mhz. I havnt tested it out in gaming yet, but Intel Burn Test was stable, and at this point I dont think I'd even see £50 worth of difference with 3200 Mhz CL14 ram, but I want the RGB so much. I was actually very close to just buying it and putting my current kit on ebay, but I thought to see if I could get my current kit working at Cas 12 first. I did see the new Tracer DDR4 ram that Crucial have, along with the 3200 Mhz CL16 kit, but the prices on both arent competitive to Samsung b die and actually cost too much compared to it.